The Global Report provides data for 119 economies around the world and is a useful basis for bench-marking and monitoring trade facilitation performance. 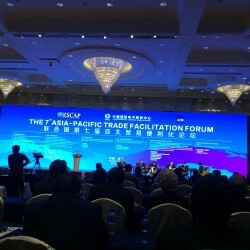 It includes information on the implementation of some of the key measures included in the WTO Trade Facilitation Agreement as well as some innovative and technology-driven measures aimed at enabling trade using electronic rather than paper-based data and documentation also referred to as ‘paperless trade’. Key findings from the report suggest that the global average implementation rate of the ambitious set of trade facilitation measures considered in the report is about 53%. Developed economies average implementation rate exceeds 75% while Pacific Island developing economies barely reaches 26%. The top trade facilitation performer among all the economies included is the Netherlands. Singapore and Republic of Korea lead East Asia, United Arab Emirates leads the Middle East and North Africa region, and Benin and Mauritius lead the Sub-Saharan Africa region. India leads the way in South Asia while Russia and Turkey lead the Europe and Central Asia region. Several leaders emerge in Latin America and the Caribbean including Mexico, Colombia, Ecuador and Chile. Overall, the Report finds that most economies have already taken concrete steps towards streamlining trade procedures. A significant number of developing economies, particularly in East Asia and Latin America and the Caribbean, have actually implemented many of the commitments associated with the WTO Trade Facilitation Agreement. For most, however, a lot remains to be done. An integrated step-by-step approach is suggested, starting with building up institutional arrangements and inter-agency cooperation. Going forward, the strong positive relationship found between trade facilitation implementation rates and trade costs highlight the need for countries to strive for trade facilitation excellence. This can be achieved through adoption of modern information and communication technologies, as well as development of legal frameworks enabling exchange of electronic data and documents across borders. These “next generation” trade facilitation measures have just as much potential as more traditional measures to reduce trade costs and boost trade. However, capacity building and strengthened cooperation between countries at the regional and global level will certainly be needed to implement them. According to the UNESCAP Resolution 68/3 in May 2013 and subsequent Resolution 70/6 in August 2014, the Regional Agreement for the Facilitation of Cross-border Paperless Trade is now being negotiated among UNESCAP member states. 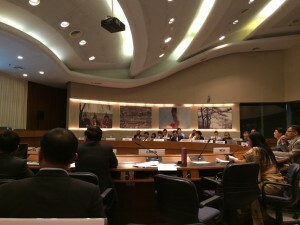 Prof. Xue, as the Chair of Legal Panel of UNNeXT, led the drafting of the legal text for the Agreement 2013-2014 and acted as one of the two legal experts to provide concrete legal advices for the intergovernmental negotiation process in April and September 2015 at UNESCAP.